The verdict is out: finding a definitive answer on the cost of breast augmentation surgery can be quite difficult. Many people have searched on Google, made some phone calls, or asked friends and family how much implants cost, but still haven’t gotten a straightforward answer. Why such an impossible feat? To be perfectly honest, the reason is: there’s no simple answer, due to a variety of factors that shape what makes up the final bill. It’s for those reasons we’ve created this article, to help women like yourself find the answers to how much breast augmentation surgery costs, and why you may have seen such a wide range of estimates. Here at Austin-Weston, we’ve been in practice for almost 40 years, and during that time we’ve performed tens of thousands of breast augmentation surgeries and helped women achieve their desired results. So, in this article, we’re going to break down each of those factors to give you a closer idea of the cost of breast augmentation surgery and hopefully a more realistic view of what to expect to help in making that final decision toward a better ‘you’. Breast augmentations are the top surgery performed in the United States with 290,467 procedures in 2016 alone, up 4% from the year prior. According to statistics from the American Society of Plastic Surgeons (ASPS), the national average cost for breast augmentation surgery is $5,822. However, it’s important to note that this cost can vary dramatically from one patient to another and often does not include other surgery-related expenses. Generally, the major costs that factor into your total are the surgeon's fee, facility fee, anesthesia fee, post-surgery fees and cost of implants. So, to provide a somewhat straightforward answer, the overall cost of breast augmentation surgery can range from $5,000 to $10,000. All surgeons have their own approach to performing breast augmentations as they have different amenities at their disposal and different levels of experience and accreditations. It’s fair to assume that selecting a surgeon can singlehandedly be the most significant influence when it comes to the total cost of a surgery. For example, at Austin-Weston, our four board-certified plastic surgeons have accumulated a combined 75 years of experience, and with that have cultivated an excellent reputation in the DC Metro Area community, performing several breast augmentations each week. To find ballpark prices for procedures based on location by using the Healthcare Blue Book (it works the same way the famous Kelley Blue Book lists the prices of cars). This is an important factor to consider not only because of overall cost but because it may put a price tag on the importance of your safety and satisfaction. The importance of having your procedure performed in an accredited surgical facility by qualified staff is critical in the decision-making process. 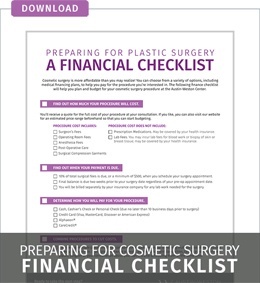 Do not try to cut costs by sacrificing safety and having your procedure performed at a non-accredited practice or by a surgeon who is not certified by the American Board of Plastic Surgery. The Austin-Weston Center for Cosmetic Surgery is a beautiful, free-standing surgery facility located in Reston, Virginia, fully-equipped with five surgical suites. Our operating rooms are fully certified by the Accreditation Association for Ambulatory Health Care (AAAHC), an association that accredits office-based surgical facilities. The cost of anesthesia for breast augmentation surgery can also vary. If a board certified anesthesiologist is used then the price for a breast augmentation will be higher. If a CRNA (nurse anesthetist) is used then the price will be lower. Another factor that can decrease cost is when a doctor uses a non-certified anesthetist nurse, or a medical assistant to push the anesthetic drugs (and yes, unfortunately, this does happen). This is an hourly fee, and if the surgeon is taking his time to make the results as meticulous as possible, the anesthesia fee will be higher. This can also vary depending on the technique used for the surgery, which can sometimes take longer or shorter to perform. While it is essential to have a basic understanding of the other factors that influence the cost of a breast augmentation, one of the most significant is your choice of breast implant. The price for breast augmentations varies depending on an individual patient’s goals and needs with surgery. Silicone gel breast implants are more expensive, as they are filled with a cohesive gel that holds together uniformly while retaining the natural give that resembles breast tissue. These are prepared by the manufacturer and tested for quality to ensure uniform fill volumes. There are several different types of silicone implants so the cost per implant does have some variability. In the world of silicone implants, there are some such as ‘gummy bear’ or ‘shaped’ implants that cost more than regular round silicone implants. The surgeons at Austin-Weston offer every commercially available breast implant that is accessible in the United States. After calculating the cost of surgeon's fees, breast implants, anesthesia, surgical facility fees and all other expenses are compounded, it often reaches a total between $5,000 and $10,000, if not more. Many women who desire a breast augmentation don’t have this amount of money at their immediate disposal, but when the decision is made that it’s the right time to undergo the procedure, it becomes necessary to consider financing options. Practices almost always accept credit cards, but patients should carefully consider the associated interest rates of all available options. Also, there are several third-party financing companies that deal exclusively with those who want or need treatments that are not covered by insurance. Another component to consider is the breast implant warranty. Warranties add value to your breast augmentation package by protecting you from additional costs down the road. Some warranties are free with the purchase of implants. All primary breast augmentation surgeries performed at Austin-Weston come with a three-year warranty, free of charge. This covers implant malposition, capsular contracture coverage at no cost, and implant size changes at the cost of the implant only. Selecting a well-qualified, board-certified plastic surgeon and asking the right questions will increase your chances of getting the most favorable return on investment, which is exactly what plastic surgery is: an investment in ‘you’. The four board-certified surgeons at Austin-Weston are dedicated to providing patients with the results they desire and the care and safety they deserve. To find out more about your plastic surgery options, please call (703) 854-9841 to schedule a free consultation.